Israel has certainly had its share of attention in the news lately. How often do we hear about the Israeli-Palestinian conflict, and for how many years now? Is that really STILL going on? Each political party’s position on Israel and the authenticity of Jerusalem seemed to be a key point of each platform in this election year. Why the heck is that a factor? And now we hear that Israel is threatening to attack Iran before Iran attacks Israel, and many think that Iran may be developing a nuclear weapon. How are we somehow mixed up in the middle of all this? Confused? I was too, so I set out to try and make sense of all this nonsense. Keep reading and I’ll explain why Israel matters so much, why everyone seems to be talking about it, and why it will matter even more in the near future. In the Bible, Israel was the land Yahweh gave to his chosen people, the Jews, through a covenant with Abraham, his son Isaac, and his grandson Jacob, who was renamed “Israel” by an angel of God after the angel was unable to defeat Jacob in a late-night wrestling match (Israel means “one who wrestles with God”). Jacob, or Israel, had 12 sons, who became the direct ancestors of the “12 tribes of Israel”. It was these chosen descendants of Abraham that Moses, Jacob’s great, great grandson, led out of slavery from Egypt back into the Promised Land of Israel, also known as Canaan or Palestine. Judaism flourished in the area, followed by Christianity. The land of Israel was conquered and re-conqured by numerous tribes and empires throughout the ages, including the rapidly-expanding Islamic empire in 635 C.E. Islam is the third great Abrahamic religion, stemming from Judeasim and Christianity, and is largely focused on the revelations of the prophet Mohammed. The region remained under Muslim control for 1300 years. This bloody piece of real estate then changed hands many times during the Crusades of the Middle Ages and was eventually taken over by the Ottoman Empire, which then lost the land to the British after World War I.
Zionism, a Jewish movement of nationalism that encouraged displaced Jews to return to Israel and form an independent state, began to grow, especially after the horrible atrocities of the Holocaust during World War II. In 1948 Israel declared its independence from the expired British rule and was recognized as a democratic state by the United Nations in 1949. Immediately after declaring independence, Israel went to war with the Arab nations surrounding it, and the area has remained in perpetual conflict ever since. 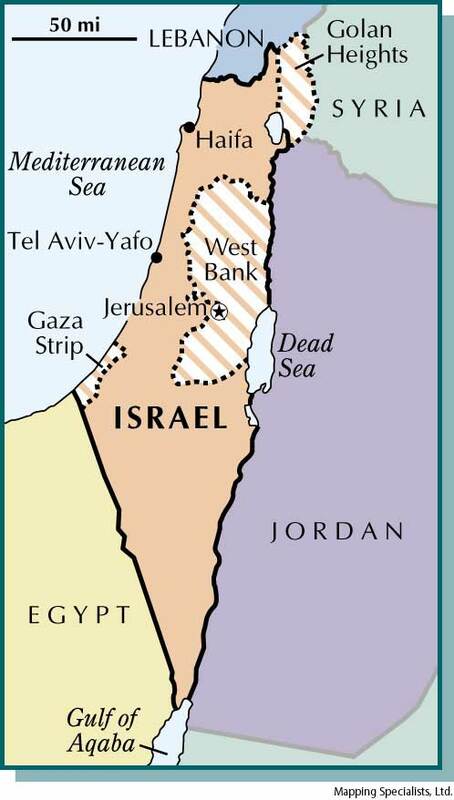 Today, this region is fiercely divided between the Jewish-controlled state of Israel, the West Bank and Eastern Jerusalem controlled by the Islamic Palestinian Authority, and the Gaza strip controlled by Hamas, a terrorist offshoot of the Egyptian Muslim Brotherhood. The Islamic State of Palestine declared its independence in 1988. However, while Palestine is recognized as an official state by two thirds of the world’s countries, it is not recognized by the United Nations or several Western countries, including Israel and the United States. The city of Jerusalem is literally at the heart of this conflict. During its history, Jerusalem has been destroyed twice, besieged 23 times, attacked 52 times, and captured and recaptured 44 times. Following the 1948 Arab-Israeli War, Jerusalem was divided with Jews mainly in the western part and Palestinian Muslims and Christians mainly in the eastern part. Following the 1967 Six-Day War, the eastern part of Jerusalem came under Israeli control and was annexed by Israel. Most of the international community and the United Nations declare this annexation illegal, however today both the Jewish State of Israel and the Islamic Palestinian National Authority claim Jerusalem as their capital city. The United Nations, as well as the United States, does not officially recognize Jerusalem as Israel’s capital, and instead favors it becoming an international city, or at least a peaceful shared capital between both Israel and Palestine. Jerusalem is such a hotbed of violence mainly because it sits at the exact intersection of the world’s three great Abrahamic religions that all originated there, with each faith laying claim to several historical sites of significant religious importance. According to the Bible, King David established Jerusalem as the capital city of God’s Holy Land, and his son Solomon built the first Jewish Temple there. 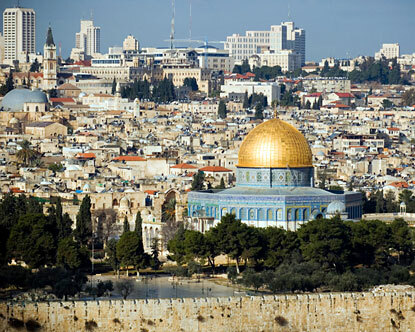 Modern Jews consider the entire city holy, and many make pilgrimages to the Western Wall or “Wailing Wall” in the heart of the Old City, believed to be the remaining wall of the second temple built by King Herod. Jerusalem is important to Christians as the site of many significant events in the life of Jesus, including the Last Supper, the Crucifixion, and the Resurrection. Muslims believe that the prophet Mohammed was carried from Mecca (in modern day Saudi Arabia) to the temple in Jerusalem on a magic flying horse, where he ascended to Heaven to receive Allah’s holy instructions. The Islamic shrine the Dome of the Rock was built on top of the Jewish Temple Mount. The United States and Israel have become strong allies due to shared democratic and religious values. Israel is also one of only 2 non-NATO allies in the Middle East, making it an important strategic ally. The U.S. has generally supported the Zion movement and was instrumental in helping Israel attain statehood. Additionally, the U.S. has supplied Israel with military weaponry to defend itself, and Israel is the largest recipient of U.S. aid since WWII, receiving $3 billion a year from us since 1985. The Democratic party even came under fire this year when it originally neglected to mention Israel at all in its official Party Platform. Many find this favoritism dubious, and it has caused added tension with many of the world’s Islamic nations. Iran’s President Ahmadinejad is sympathetic to Palestine and has publicly threatened Israel with annihilation, and Israeli Prime Minister Netanyahu has implored the U.S. to stop Iran from developing a nuclear weapon. Israel has also threatened to preemptively attack Iran if the U.S. does not intercede. We are being dragged into a fight. Some people actually see potential military conflict over Israel as a good thing! Both the Old and New Testaments predicted that God would gather the scattered Jews into a nation once again, and in 1948 when U.S. President Truman cast the deciding vote for Israel’s statehood, Israel’s Chief Rabbi claimed that Truman’s vote had fulfilled a 2500 year old biblical prophesy. 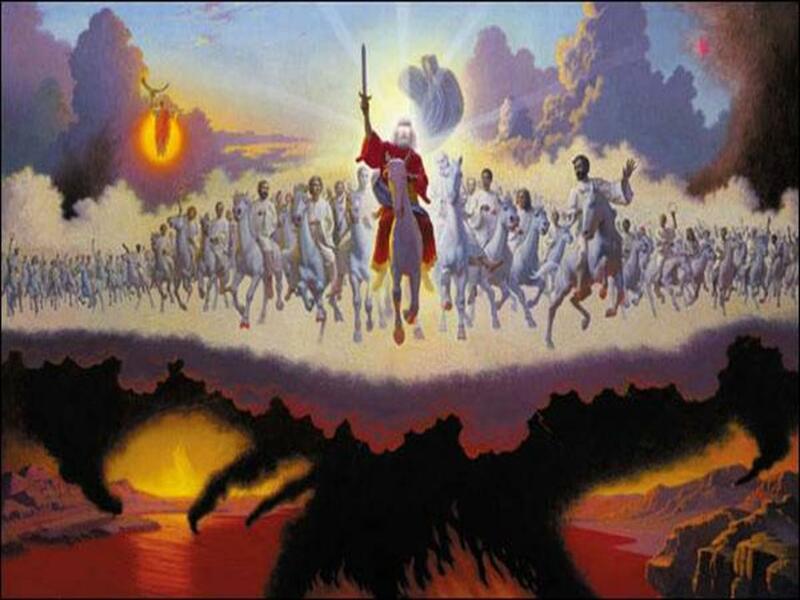 The Bible also predicts that Israel will be horribly attacked one last time, triggering the Second Coming of Jesus Christ, Armageddon, and God’s Final Judgement, followed by the renewal of Jerusalem and Heaven on Earth. Indeed, many conservative Christians believe that we are living in the End Times right now, and that WWIII would be a welcomed signal of the return of their savior. Do you find that as terrifying as I do? I see the whole situation as nothing more than a bunch of whiny children fighting over control of a sandbox, arguing over whose version of their imaginary friend is more real. The only problem is, the children have nuclear weapons to play with, and their silly squabble could destroy us all. ~ by christhehumanist on September 30, 2012. Well said, and I have the same concerns as you do for the same reasons….so my friend …. we will wait for the next chapter and verse …….